Grade II listed building well restored as a Virgin Active Fitness Centre. External goods dock and canopies also survive. Internally the building has been stripped. The derelict shell of the Great Northern corn warehouse stands nearby awaiting redevelopment of the site. Notes: The station building was designed by Thomas Chambers Hine, a prolific Nottingham architect who, among other commissions, remodelled the city’s castle. London Road station was a complex design, with an eclectic mix of styles, some repeated from the lace warehouse he had just completed for Page & Co. It combined passenger and goods facilities within a single structure. Red brick was used with ashlar and yellow brick dressings. The dominant influence was the French château style but with Jacobean additions. On the northern façade a T-shaped Romanesque porte-cochère on iron columns, painted to look like wood, was the centrepiece, with a Venetian bay window above it on the main building; this, in turn, had a further arched window above, and a curved gable with a clock in front of a pavilion turret topped by fancy iron cresting. The hipped slate roof had nine coped brick ridge and two side chimneystacks. The two-storey building continued either side of the porte-cochère with bays on each floor, having round-headed openings on the ground floor and rectangular upstairs, with balustrading above. Diamond-shaped (diaper) patterns on the brickwork gave added interest. The façade curved as a tall, single-storey structure to face westwards, with segmental-arched windows, balustrade and a central Jacobean gable. The attached western block was less exotic than the northern façade with segmental-arched fenestration and a complementary large doorway. A row of round-headed attic dormers and a Venetian window beneath its own gable fronted the pitched roof. Finally, at the southern end, was a sombre single-storey pitched-roofed structure with segmental-arched windows, carried above a vehicular entrance to the station. The platforms were at first partly sheltered by a short four-bay iron-roofed trainshed, but the GNR lengthened this with three wider bays. They had curved wooden gable screens and clerestory sides which overlooked sloping canopies above the side platforms. Typical GNR features were the four-way floral iron brackets and serrated valances. Biddle (1973) remarks that that it was strange that ‘such a pile should fall into the ownership of the Great Northern, of all companies’; elsewhere he opines that the GNR’s most important contribution to nineteenth century building was in distributing the cheap Fletton bricks all over the country from the Peterborough brickfields, rather than constructing its own buildings of architectural merit. He also notes (2003) how splendidly London Road Low Level station has now been restored after a period of abandonment, complimenting the attention to detail. A 2-road shed immediately east of the station was opened by the Ambergate, Nottingham, Boston and Eastern Junction Railway in February 1858. It was closed by the GNR in 1906 and stood until c1920. The London & North Western Railway had running powers into the station for trains from the Great Northern and London & North Western Railways Joint Line from Market Harborough to Bottesford and Saxondale via Melton Mowbray. The LNWR also maintained its own goods station nearby at Sneinton. In October 1953 London Road station was host to a travelling exhibition called 'Royal Journey by Kings and Queens'. This comprised a magnificent collection of royal coaches with brocaded furnishings, a historic royal pilot locomotive and models, photographs, crest and headboards. The display gave a picture of the comfort enjoyed by kings and queens of the past hundred years. At the head of the display the Royal Pilot was Caledonian 123, built in 1886 as an exhibition loco. The building was Grade II listed on 12 July 1972, amended 30 November 1995 . After closure to all rail traffic in 1988 the station was refurbished for industrial use but was severely damaged in a fire in 1996. It was subsequently restored and was converted to a Holmes Place health and fitness club. It is now used as a Virgin Active Health Club. Although completely stripped internally, externally the building is little changed from when it was built. The derelict Great Northern corn warehouse still stands to the east of the warehouse which was built in 1857 and also designed by TC Hine. The two-storey warehouse was brick-built with a hipped sheet metal roof. The Grade II listed the building was sold by Nottingham City Council to the present owner with a contractual obligation to carry out a restoration scheme. However, no repairs were carried out - only suspected arson attempts. In 1998 a lot of the original internal design was damaged in a major fire. The roof collapsed and cast iron columns and wooden sack hoists were removed in the clear-up process. One area of the warehouse is now just an empty shell held up by an extensive scaffold. In 2000, the owner was refused listed building consent to demolish the structure. The bodies of two women were found in the building in 2005, which led to two men being jailed for murder in 2006; one said he wanted to become the city's first serial killer. The warehouse lies within the East Side Masterplan for the regeneration of the whole area. The Ambergate, Nottingham, Boston and Eastern Junction Railway was borne out of a scheme to link Manchester with Boston and the East Coast. The new line would form a junction with the proposed Manchester, Buxton, Matlock and Midlands Junction Railway at Ambergate. It would then proceed eastwards running north of Ripley and Eastwood to the proposed Midland Railway line from Bulwell to Nottingham. There it would join the Midland's Lincoln line as far as Colwick where there would be a junction. Proceeding to Grantham and Spalding, there would be two branches, one to Sleaford, the other to Boston. Not only were subscriptions minimal, some investors reneged on their pledges - a common state of affairs in early railway history. In the event it only opened from Nottingham to Grantham. The Ambergate, Nottingham and Boston and Eastern Junction Railway Act received Parliamentary approval on 16 July 1846. Despite crossing a number of river valleys, the terrain was favourable. The major engineering work was the viaduct at Radcliffe over the River Trent. Rather than build its own expensive station in Nottingham, the ANB&EJR sought running powers into the Midland Railway's Carrington Street station, from a junction at Colwick. With the support of the city fathers it obtained these, but the Midland insisted that ANB&EJR bought out the Nottingham and Grantham Canals two months after opening the line from Ambergate to Grantham. This final blow to the company’s overstretched finances was to have unfortunate, and unintended, repercussions for the Midland. The line opened for passengers on 15 July, 1850 from its own terminus at Ambergate Yard at the Old Wharf in Grantham to Colwick Junction. 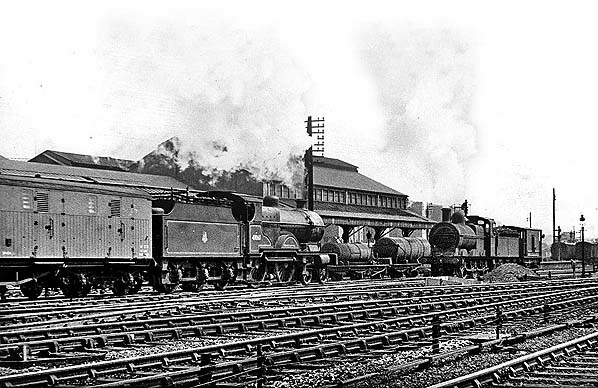 Both the Midland and the LNWR were interested in making a takeover, since it would impede the Great Northern's progress. Meanwhile, the Great Northern was keen to penetrate Nottinghamshire and its coalfields, something that Midland in particular was resisting, making a takeover offer in 1851. However a member of the GNR board had acquired a holding of ANB&EJR shares and was able to resist the offer. In 1852 the Great Northern arrived at Grantham and a connection was built into its station. Running rights were agreed such that the GN was able advertise through coaches from Nottingham to London in competition with the Midland. The Midland obtained an Order in Chancery preventing the GN from running into Nottingham, but in 1852 an ANB&EJR train arrived in Nottingham with a GNR locomotive at its head. When it uncoupled and went to run around the train it found its way blocked by a Midland loco, while another blocked its retreat. The engine was shepherded to a nearby shed and, for good measure, the tracks were lifted. 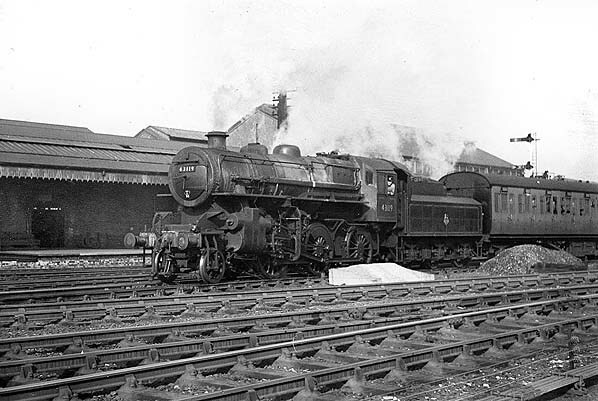 This episode became known as the 'Battle of Nottingham' and, though the action moved to the courtroom, it was seven months before the loco was released. From 2 April 1855 the Great Northern agreed to work the line for a period of ten years. The directors of the ANB&EJR, not having completed the line throughout, held that they were not bound to buy the two canals. The canal proprietors took the matter to court, the sale was affected and, in 1860, the name was changed to the Nottingham and Grantham Railway and Canal Company. In 1861 it was leased to the GNR completely. GNR trains originally used the Midland station in Nottingham, but there were frequent disputes, especially when the GNR began running through trains from London via Grantham in a shorter time than the MR could manage. Though the Midland grudgingly accepted passengers into its station, it refused to handle goods which had to be carted from the terminus at Colwick. To solve the problem, the GNR opened their own terminus along with an impressive goods and corn warehouse at London Road on 3 October 1857 served by a new line from near Netherfield, adjacent to the Midland line whose tracks they had previously used. The Derbyshire and Staffordshire Extension between Colwick and Egginton Junction (in Staffordshire) was built during 1872-8 with a branch up the Erewash Valley from Awsworth to Pinxton via Eastwood. This line was deliberately designed to run near all the main collieries in the Erewash Valley and included the impressive 1,440 foot long Bennerley viaduct and the Giltbrook viaduct. Another GNR line running up the Leen Valley from Bulwell to Newstead (alongside the MR’s Mansfield Branch line) opened in 1882 and was extended to Shirebrook in 1901. The Leen Valley Line’s main objective was “to muscle in on the coal trade” and soon every major colliery in the area had both GNR and MR branches running into it. When Nottingham Victoria railway station was opened on 24 May 1900, the Great Northern had to construct a new chord line, carried mainly on brick arches and steel girders, by means of a junction at Trent Lane, east of London Road, to Weekday Cross where it joined the Great Central main line. This new chord included a station which opened before Victoria on 15 March 1899 on an island platform reached, by means of a staircase from the booking office on the same approach road to the earlier London Road terminus. To avoid confusion, the new station was designated 'High Level' and the old station became 'Low Level'. The transfer to Victoria Station gave the Great Northern a prestigious location and avoided their need to reverse trains to and from Grantham, Derbyshire, and north of Nottingham. Passenger services at the low level station were substantially reduced with the opening of Victoria station and the last passenger service ran on 22 May 1944. The station however remained open as a mail depot for troops during the Second World War and as a goods station until 4 December 1972. After that date it remained in use as a parcels concentration depot finally closing in the c1989. In the 1880s, the city of Nottingham had expanded into its surrounding villages and hamlets which, in turn, had grown into suburbs. These needed to be connected to the rail network. At this time the only competition to the railways came from horse-drawn trams and omnibuses which were slow, could only carry light loads and not travel long distances. The 1860s and 1870s had seen the unrivalled success of the London underground railway system and its associated commuter lines so, in the late 1880s, a group of Nottingham businessmen felt that the creation of a railway on similar principles would benefit the city’s rapidly growing suburbs. The Great Northern Railway had opened its Derbyshire extension line into Nottingham in 1878; however its principal concern had been to link up the numerous coal mines to passenger traffic. In addition, trains had to make a 7¼-mile circuitous journey from Nottingham, first travelling eastwards to Colwick (later known as Netherfield & Colwick) before heading north-west through Gedling, Mapperley and Daybrook to Basford which, on a direct route, was a mere 3¼ miles from the city centre. The Nottingham Suburban Railway, so its backers thought, could complement the Great Northern’s extension line as well as providing a more direct route into the city. An agreement was arrived at whereby the GN would work the proposed line, providing all the locomotives, rolling stock and staff; in return it would retain 55% of the gross receipts. Despite this arrangement, it is worthy of note that the Nottingham Suburban Railway company remained an independent entity until 1 January 1923 when it was absorbed by the London & North Eastern Railway. Passengers were not the only motivation for building the line. One of the leading promoters, Robert Mellors, was chairman of the Nottingham Patent Brickwork Company whose works were on the proposed route at Thorneywood, and it was put forward that a branch be built to serve them. This plan received approval from a director of the company, Edward Parry, who would go on to become the line’s chief surveyor and structural engineer. The branch would become the only one of note from the line, running a distance of just 198yd, of which 110 were in a tunnel taking it beneath Thorneywood Lane before climbing an inclined plane along which wagons were hauled to and from the brickworks. The company obtained its Acts during 1886 and these were strongly supported by Nottingham City Council. By October 1886 Parry had surveyed and staked out the route. Construction work began in June 1888. Some 3¾-mile in length, it ran from a junction with the Great Northern Railway at Trent Lane and headed north to another junction with the GN’s Derbyshire extension line at Daybrook. Intermediate stations were built at Thorneywood, St Ann’s Well and Sherwood. Because of the hilly terrain, the railway proved extremely costly to build, with one-sixth of it built in four tunnels, the longest being just over quarter of a mile long. In addition, there were seven brick-arched bridges, nine girder bridges of which three were over 100ft in span, eight culverts and numerous retaining walls, embankments and cuttings. Construction costs were increased by a third as the Midland Railway insisted that all bridges carrying the line over its metals were at least 50ft wide whilst the Great Northern demanded a flyover at Trent Lane to avoid conflicts on their Nottingham-Grantham line. Despite these adversities, the line was completed by 23 November 1889 and opened both to passenger and goods traffic on 2 December of that year. In 1890 there were ten trains per day running out of London Road along the line to Daybrook, four of which continued through to Newstead. In the opposite direction were nine trains of which four originated from Newstead. There was no Sunday service. The journey time from Nottingham to Daybrook was a very respectable 13 minutes. By 1895 there was a through train to Ilkeston which, on Fridays, was extended to Derby Friargate. Unfortunately, within a little more than ten years, two developments occurred that would render the Nottingham Suburban Railway superfluous. The first was the arrival of the Great Central Railway which, in 1900, had opened up an even more direct route into Nottingham. Trains along the GC’s own Leen Valley railway could run directly from Newstead via Bulwell, New Basford and Carrington into Victoria Station, thus cutting out the lengthy negotiations of Daybrook Junction and Leen Valley Junction on the Great Northern route. The second was the introduction of the electric tram. Horse-drawn trams had been operating in Nottingham since September 1878; however the arrival of the electric tram offered a quicker, more frequent service than the trains. The first route opened to Sherwood - running along Mansfield Road close to Sherwood Station - on 1 January 1901. Extensions to St Ann’s came on 21 February 1902, Thorneywood on 16 December 1910 and Daybrook on 1 January 1915. With their comparatively light loads and easy acceleration, the trams could negotiate the gradients in the hilly east of Nottingham more easily than steam locomotives. Indeed the clanging of the tram bell would, in the coming years, often sound the death-knell for many a suburban railway station. A third factor was offered to Railway Magazine (August 1961) by a correspondent, J P Wilson, as an addendum to an article about the Nottingham Suburban Railway in the magazine two months earlier. He noted that the line traversed one of the few areas of the city of Nottingham where little housing development had taken place by the start of World War I. Only Thorneywood station was at all conveniently situated when the line was open, while St Ann’s Well was particularly remote. He added: ‘In the last thirty years small housing estates have come near to all three stations, far too late in the day to have any influence. One can only conclude that the whole project was something of a gamble, especially as to passenger traffic’. The 1 in 49 gradient from Trent Lane Junction, which was also on a curve, posed particular problems for the GN’s Stirling 0-4-4 tanks which worked the line. In order to achieve faster journey times than the trams, some of the suburban services were run non-stop from London Road to Daybrook. By 1914, whilst there were still eight trains per day each way along the line, only four of these stopped at the intermediate stations. For example, St Ann’s Well saw departures for Basford & Bulwell at 7.55am and, to Shirebrook, at 9.11am, 1.20pm and 4.58pm. In the opposite direction, trains departed for Nottingham at 8.24am, 2.21pm and 6.01pm. It is also worthy of note that other trains passed through the station at 11.38am, 8.40pm and 9.50pm en route to Shirebrook and to Nottingham at 10.36am, 12.59pm, 9.20pm and 10.41pm. Even before the closure of the intermediate stations - which at this time was less than two years away - more passenger trains passed through than stopped. One can only imagine the long-deserted platforms at St Ann’s Well which, just a few years earlier, had anticipated unprecedented numbers of customers. As a supposed wartime economy measure, the three intermediate stations were closed to passenger traffic on 13 July 1916 and, thereafter, just two trains a day along the Leen Valley route used the line. After the war it became evident that the Great Northern had little interest in promoting services along the line nor reopening the intermediate stations. Bradshaw of July 1922 shows that, just prior to grouping, only three trains passed daily over the line. On 25 January 1925 the collapse of Mapperley Tunnel on the Great Northern extension brought a brief flurry of activity for the Nottingham Suburban when all Leen Valley passenger and coal traffic was diverted over the line whilst repairs were effected. Also, on 10 July 1928, their majesties King George V and Queen Mary opened the Royal Show at Wollaton Park and the new university buildings. Between these two events their majesties reviewed a huge gathering of school children in Woodthorpe Park. As the nearest station was Sherwood, both Thorneywood and Sherwood stations were renovated and re-staffed for the occasion. This made it possible for 6,550 of the 17,500 children and 284 of their teachers to be brought in on 13 special trains. It is ironic that, on that one day, the two stations saw more activity than they had ever done during their operational days. The line was converted to single track with the removal of the down line on 9 February 1930 when the signal box at Sherwood was closed and all signalling removed. The line was then worked by staff who unlocked the ground frames controlling the siding connections. Not long after, the footbridges and canopies were removed from the stations, a clear indication that they would never reopen. The last passenger train to use the line was the 5.05pm Nottingham Victoria to Shirebrook via Trent Lane Junction on 14 September 1931. Services had lasted just 41 years, with the intermediate stations faring even worse with an operational life of just 26½ years. The next misfortune to befall the line occurred on the night of 8 May 1941 when, during Nottingham’s worst air raid of the Second World War, considerable damage was done in the Sneinton area. A bomb landed on the southern section of the line damaging a bridge over the Midland Railway and blowing away part of the embankment. This was never repaired and buffer stops were erected at either side, effectively creating two dead ends. Subsequently the goods service along the line was reduced to a thrice weekly pick-up, carrying domestic coal between Daybrook and Thorneywood only. But even this ended on 1 August 1951 thus bringing the story of the Nottingham Suburban Railway to an end. The last-ever passenger train to run over the line had been a chartered enthusiasts’ special between Daybrook and Thorneywood on 16 June 1951. Apart from a short section at Daybrook, the tracks were lifted between June and October 1954. 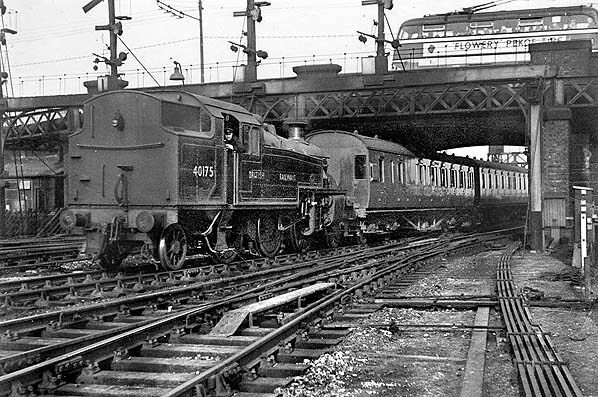 When the connection at Daybrook Junction was removed on 24 February 1957, the end of the line had truly come. Today little evidence remains of the Nottingham Suburban Railway. Being situated in the city’s suburbs, both residential and industrial developments have obliterated most traces of it. The line's course from Thorneywood station to Sneinton Tunnel has been made into a footpath. The latter’s portals have been partially obscured by infilling but access into the bore is still possible for members of the local gun club. Descending to Sneinton Dale, nothing remains of the three-arch viaduct which once took the line over it and the site is now occupied by a doctor’s surgery, medical centre and police station. The footpath resumes at a point just south of Sneinton and follows onwards to Colwick Road where the bridge has been removed. The girders of the bridge over the Midland Railway have gone; however the segmental arch and abutments at Trent Lane still exist. Few people are now aware that the Nottingham Suburban Railway existed. The line which was built to serve early commuters has almost disappeared but one cannot help wonder whether it might have found a fruitful role today, when we are all being urged to ditch the car in favour of public transport. Could it have formed the basis of a regenerated public transport infrastructure in the city? We will never know. Tickets from Michael Stewart. Bradshaw from Nick Catford. Route maps drawn by Alan Young. The Story of the Nottingham Suburban Railway: v. 2: The Operational Years David G Birch - Book Law Publications 2012. Volume 3 has yet to be published. Take the Grand Tour - A photographic survey of all the tunnel portals and bridges along the Nottingham Suburban Railway in 1904. 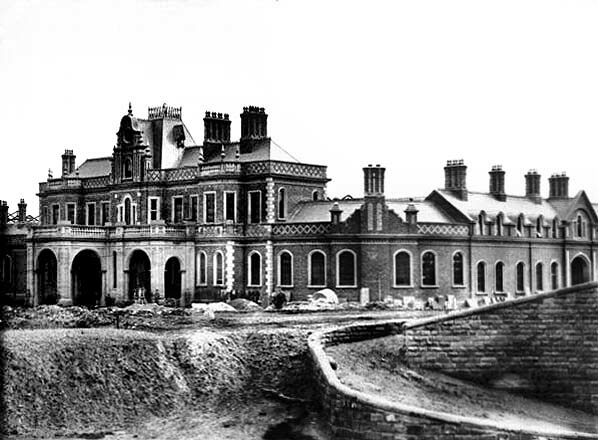 Nottingham London Road station during construction in 1857. 1885 6-inch OS map shows the proximity of the Midland station seen on the left and the GNR's London Road station in the centre. The GNR's large corn warehouse is seen to the east of London Road station. The rail-served Eastcroft gasworks is seen between the station and a short arm of the Nottingham Canal. Canal. Click here for a larger version. 1881 1:500 OS Town Plan clearly shows the layout of the station as built. 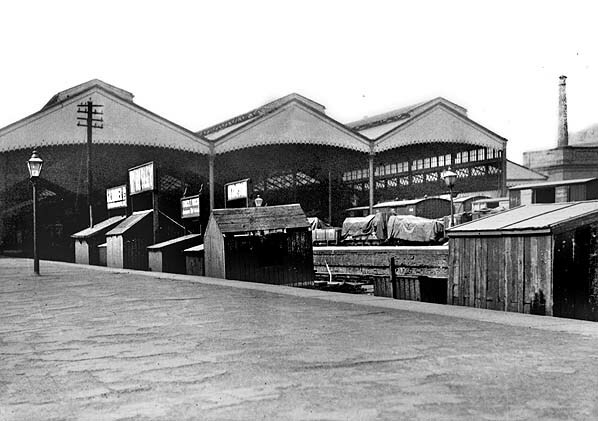 The original trainshed covered only the west end of the station; this was later extended by the GNR. There is a two-road engine shed immediately east of the station. Although the LNWR had its own goods station nearby it also had a goods warehouse at London Road. The GNR corn warehouse is seen top right. The Midland line runs along the bottom of the map. Click here for a larger version. 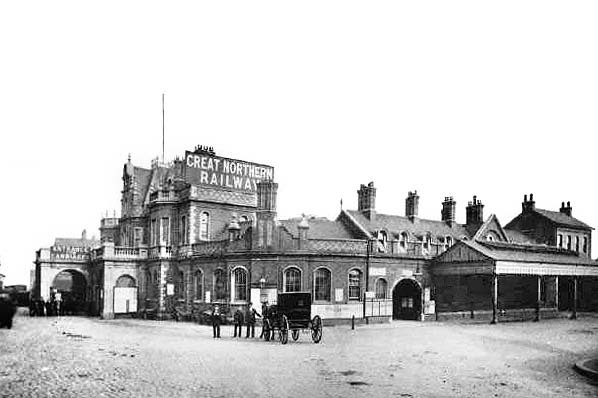 The impressive forecourt at Nottingham London Road station c1890s. The entrance to the goods shed was to the right. 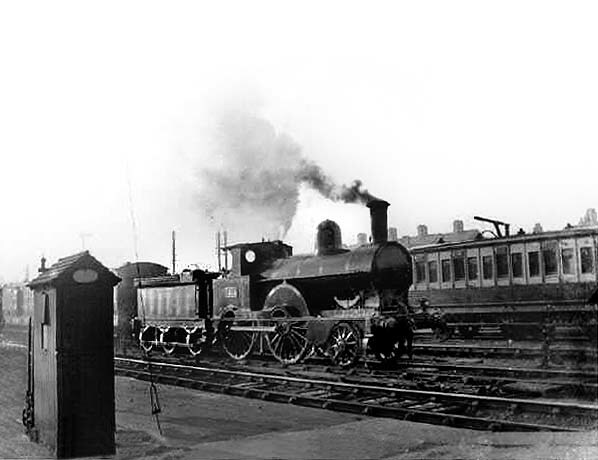 LNWR Improved Precedent class 2-4-0, 1214 'Prince Albert', at London Road station c1900. Originally designed for express passenger work this class later gained the nickname of ‘Jumbos’. 1214 was designed by FW Webb and built at Crewe works in November 1890 and scrapped in April 1914. One example of this class, 790 Hardwicke, has been preserved in running order as part of the National Railway Collection. On 22 August 1895, 790 Hardwicke took 2 hours and 6 minutes for the 141 miles from Crewe to Carlisle, with an average speed of 67.1 mph setting up a new speed record during the ‘Race to the North’. Nottingham London Road Low Level station looking west at the 3-bay extension to the trainshed in 1921. There was very little passenger traffic by this time with only one platform face being required. Goods wagons are seen in many of the station roads. The 1922 Bradshaw lists five up trains to London Euston and five back plus one extra on Wednesday on the GNR/LNWR Joint service. The only other train using the station was a single early morning service to Shirebrook. 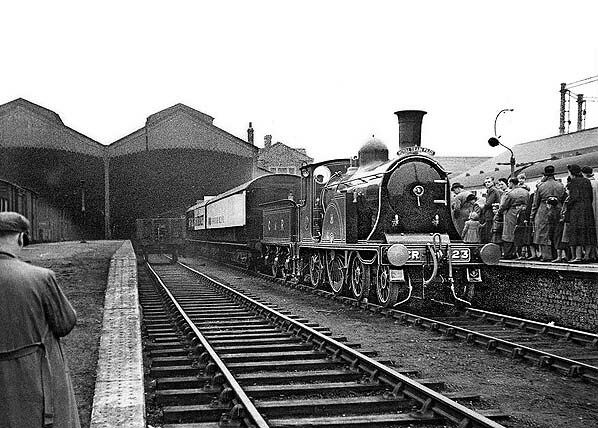 A London Euston train on the joint service with the LNWR waits to depart from Nottingham London Road station in 1922. 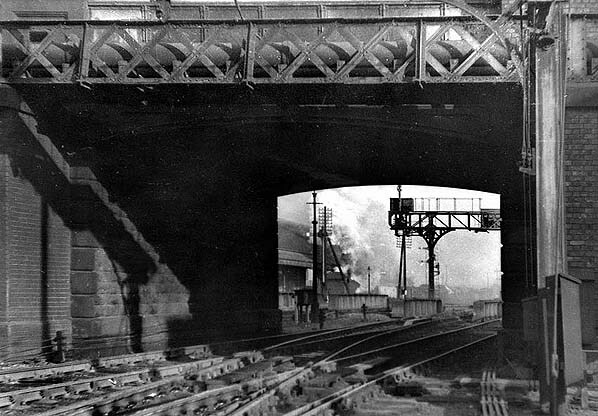 Looking east at London Road bridge c1951. The bridge over the Nottingham Canal is seen on the far side of the bridge. Beyond that, a J50 is shunting at London Road Low Level station, seen to the left. A recently-built Ivatt 4F-A hauls a passenger train west past London Road Low Level station c1952. 43119 was built at Horwich works in June 1951 and survived until August 1967 when it was withdrawn from Lostock Hall shed. This picture and the one below clearly show the three-bay extension added to the original four-bay trainshed by the GNR. The outer platform face and canopy is part of the goods shed which was incorporated into the station building. 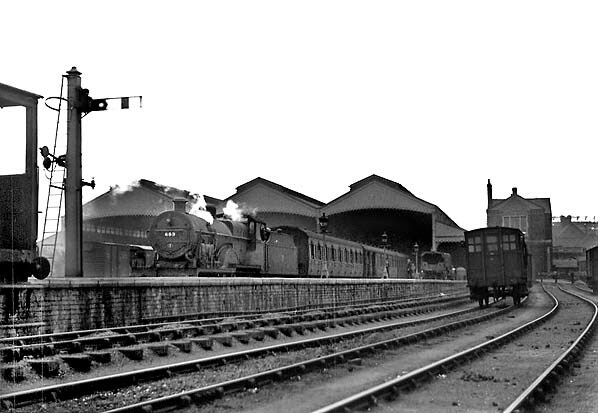 Caledonian 123 at Nottingham London Road Low Level station in October 1953. The loco was part of a travelling exhibition called 'Royal Journey'. The loco was not 'in steam' at this time as it was not restored to running order until 1958. This loco was built by Neilson and Company of Glasgow in 1886. This unique 4-2-2 was originally built as an exhibition loco but in 1914 it was placed on the Caledonian duplicate list and renumbered to 1123. 1923 saw it enter LMS service and it was renumbered again to 14010 and classified as 1P; this it carried until withdrawal in 1935 and subsequent preservation. Restored as Cally 123 by British Railways, it worked railtours until the end of Scottish steam and was then put on static display in Glasgow. During its working life it was one of the locos that took part in the ‘Race to the North’ where railway companies of the time vied to get from London to Scotland first. 123 is reputed to have regularly hauled trains at over 55mph, pushing it to its limit.